The documentary is the brainchild of the power couple. Zimmerman also reportedly sent threatening texts to Jay-Z’s co-producer, Michael Gasparro, according to Radar Online. While he was acquitted of all charges in the shooting death of Trayvon Martin, Zimmerman reportedly has been up in arms about the power couple’s film. 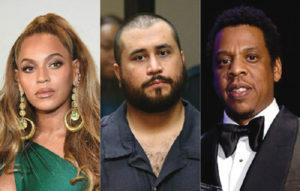 Although neither Jay-Z nor his wife have publicly responded to Zimmerman, Beyoncé’s fans have taken their anger to social media. “Here’s the tea on George Zimmerman. Enjoy,” wrote one Twitter using while sharing a screenshot of Zimmerman’s full name and address. “Oh, he’s [f…]up now! Does he know about the Beyhive?” wrote another user. Ferrari Sheppard wrote that Zimmerman’s “gator babies,” comment is the racist practice of feeding African babies to alligators in the 18th and 19th century. “He called Beyoncé a broke whore. He has to go,” Sheppard wrote.